Baring any unforeseen circumstance, the Board Chairman of Project Development Institute, PRODA, Daniel Onjeh, would be named as running mate to governorship candidate in Benue State, Emmanuel Jime of the All Progressives Congress, APC. This is just as the National Chairman of the APC, Adams Oshiomhole, has reportedly insisted that Onjeh was qualified for the position that any of the contenders. It was gathered that the APC caucus in Benue State had suggested the National Commandant of the Peace Corps of Nigeria, Dickson Akoh, as running mate to Jime, but an impeccable party stalwart on Friday said that because of Oshiomhole’s interest in Benue and for the purpose of capturing the state come 2019, he has insisted to remain with Onjeh, whom he believes is more credible and loved by majority of Benue youths. According to the source who pleaded anonymity, Oshiomhole having governed Edo State despite coming from the minority, believes Onjeh should be given a chance. Among those penned down for the number two job in the state were: Akoh, Onjeh, Nelson Alapa, and Samuel Odeh. It was also learnt that a former governor of the state and Senator representing Benue North West, Goerge Akume, is currently rooting for Odeh to deputize Jime. 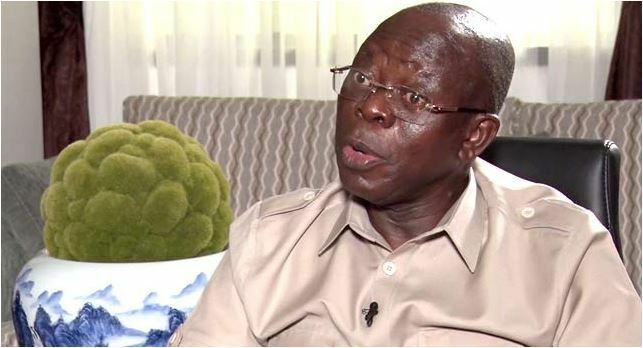 However, the source reliably revealed that ”Oshiomhole stated that Onjeh should be the party’s deputy governorship candidate due to his track record and his contribution to the party, even in the last campaign,” he said. He said, “It is high time Nigerians avoid sentiments and trust people who can deliver. ”As a product of a minority from Edo State that became a strong political figure, Oshiomhole has sympathy for minorities across the country,” he said.